It is doubtful that Babe Ruth had come across many individuals in the game of baseball who matched his stature, physical or otherwise. “Big things come in small packages” or whatever cliché you choose, the diminutive players that Ruth spoke of were brothers Lloyd and Paul Waner, members of the Pittsburgh Pirates, the New York Yankees’ opponents in the 1927 World Series. The scouting reports and first-hand accounts of players outside their own league that opposing players relied on then were not much to go on. “Watch out for that little devil,” warned Yankee pitcher Wilcy Moore of Lloyd. “I played against him in the South Atlantic League. He hits a ball that takes two hops and he’s got a base hit.”2 Indeed, Lloyd was the leadoff hitter in the Pirate lineup. In the 1927 season, his rookie year, he led the league with 133 runs and was second in hits (223) to his brother Paul (237). His 223 hits in a season is still the high-water mark for rookies in the National League. But the Waner boys showed that they could hold their weight, or anyone else’s for that matter when it came to hitting. Lloyd (5-feet-9, 150 pounds) and Paul (5-feet-8 1/2, 153 pounds) let their bats do their heavy lifting as they combined for 11 hits in 30 at-bats for a .367 batting average in the Series. Their average beat the combination of Ruth and Lou Gehrig’s by 10 points. However, it was not nearly enough as those Yankees of “Murderer’s Row” fame swept the Pirates in four games to win their second world championship. For the Pirates, it would be their last appearance in the Fall Classic for 33 years. Lloyd James Waner was born on March 16, 1906, in Harrah, in the territory of Oklahoma. (Oklahoma became the 46th state admitted to the Union in 1907). He was one of five children (two brothers Paul and Ralph, two sisters Ruth and Alma) born to Ora and Etta Waner (nee Beavers). Ora hailed from Huntsville, Illinois, and Etta was reared in Hepburn, Iowa. Both of their families made the land rush to Oklahoma in 1889 and put down stakes in Harrah, where the couple met. Ora had been a fairly good ballplayer in his younger days. He played semi-pro ball near Oklahoma City and was offered a contract by Cap Anson to play for the Chicago White Stockings, an invitation Ora turned down. Like most of his neighbors, Ora was a farmer, and naturally, Paul and Lloyd and the rest of the Waner clan were given tasks around the farm. Chores such as milking cows strengthened their wrists, and they developed strong leg muscles walking the six mile round trip to school each day. But there was another advantage. Ora managed a local team made up of the Waner and Beavers families. Before the boys were even in their teens they were exposed to playing against stiff completion, and they fared well. The Pittsburgh Pirates bought Paul Waner’s contract for a reported $60,000 as part of a conditional deal in October 1925. Paul went into his salesman’s act once more, convincing Pittsburgh owner Barney Dreyfuss to give his brother the once-over. At this point Lloyd had played in only six games for the Seals, and all it cost Dreyfuss was train fare. Lloyd joined the Pirates in April 1926 and was farmed out to their Columbia, SC, club of the South Atlantic, or SALLY League. Lloyd promptly showed his mettle, leading the Comers in hits (172), triples (14), and batting (.345). Lloyd went to the Pirates spring training in 1927 and not only made the club but also earned the starting center fielder’s job. Lloyd led off in the Bucs lineup, while Paul batted cleanup. Lloyd batted .355 for the Pirates, second to Paul’s league-leading average of .380 in 1927. The Pirates hit .305 as a team. Carmen Hill, Vic Aldridge, and Lee Meadows led their fine pitching staff. In the race the entire season, the Pirates posted a winning record against all their opponents except New York, with whom they split 22 games. They fought off the Cardinals and Giants late in the season, by winning five of seven games to capture the NL flag. They used to call us 'Big Poison' and 'Little Poison.' A lot of people have thought we had those nicknames because we were 'poison' to the opposing pitchers. But that isn't the way it came about. It started in 1927, in New York. We were playing the Giants in the Polo Grounds. There used to be this little Italian fellow who always sat in the center-field bleachers. He had a voice on him you could hear all over the park. When he hollered out you heard him no matter where you were. Paul and Lloyd returned to the family farm in Oklahoma at the end of the season and launched into an odd winter. They formed a vaudeville act. Clad in their Pirate uniforms, Paul played the saxophone while Lloyd told jokes and worked a bow across a violin. Paul would appear on stage first, Lloyd a few minutes later. Paul would question Lloyd about his tardiness, to which the younger Waner would reply that “he just finished chasing down the last ball Babe Ruth” hit.10 Their act would then get off to a rousing start. Lloyd led the league in at-bats in three of the next four seasons. In 1929 he led the league in triples (20), and in 1931 he was tops in hits (214). In 1930, Lloyd was stricken with appendicitis, and nearly missed the first three months of the season after his appendix was removed. In spite of the setback, Waner still batted .362 on the season. That wasn’t unusual. For his first six seasons in the majors, Waner averaged an amazing .340. The team didn’t do as well. Pittsburgh finished in second place in 1932 to the Cubs and in 1933 to the Giants. In both seasons the Bucs had one of the better hitting clubs, but their pitching, while respectable, just did not measure up to their adversaries. Just over a month later, on June 12, Waner was traded again, this time to Cincinnati for pitcher Johnny Hutchings. For the season Waner appeared in 77 games with three teams, 219 at bats with 64 hits for a .292 average, and he did not strike out even once. Released by Cincinnati at the end of the season, Waner signed on with the Philadelphia Phillies on December 4, 1941. The signing happened just three days before the attack on Pearl Harbor and US entry into World War II. As a result, many major league players would be called up to the armed services. And though many would fulfill their service obligation stateside, some would be called into battle overseas in Europe. Consequently major league rosters would suffer a talent depletion for the balance of the war. Many players past their prime extended their careers as a result of this opportunity. Lloyd Waner hit .261 for the Phillies, serving as a backup outfielder. At the onset of spring training in 1943, Waner was again traded, with infielder Al Glossop, to the Dodgers for Babe Dahlgren. It looked as if Lloyd would be reunited with Paul in Brooklyn, but Lloyd took on wartime job at the Douglas Aircraft plant in Oklahoma City and asked the league to be placed on the voluntary retirement list. But Lloyd quickly ended his retirement and joined the Dodgers for the 1944 season. His reunion with Paul was a short one, though, as he was released on June 14, 1944. Lloyd returned to where it all began, signing on with the Pirates. He retired at the end of the 1945 season. His lifetime batting average was .316, covering 18 years and 7,772 at-bats. He compiled 2,459 hits, 281 doubles, and 118 triples. He put together five consecutive game hitting streaks of 20 or more games in his career. Lloyd is near the top of many career batting leaders for the Pittsburgh Pirates. But obviously one statistic that you will not find his name anywhere near the top of the list is strikeouts. 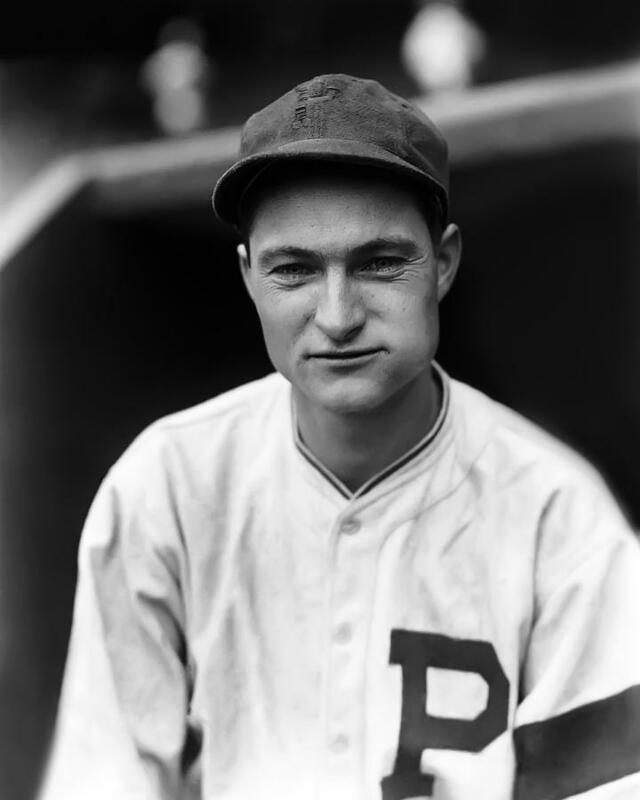 As of 2016, Lloyd ranks 129th in strikeouts among all Pirates with 167.15 (In fact, Lloyd Waner had one of the keenest eyes in major league history: he struck out once in every 44.9 at bats. He is only one of three players with more than 5,000 ABs who struck out fewer than once every 40 at-bats. The other two are Joe Sewell [62.6] and Nellie Fox [42.7]). Lloyd Waner worked as a scout for the Pirates from 1946-49. He then left baseball to take a job as a field clerk for the Oklahoma City government, a post he held until he retired in 1967. He lived comfortably with his wife Frances Mae (nee Snyder), daughter Lydia, son Lloyd Jr., and five grandchildren. Lloyd was elected to the National Baseball Hall of Fame by the veteran’s committee in 1967. “He should have been in the Hall of Fame a long time ago,” said Pirate teammate Pie Traynor. “He unjustly lived and played in Paul’s shadow. Paul was a great ballplayer, but so was Lloyd.”16 Lloyd was elated at his inclusion into the Hall of Fame. “It was the biggest thrill and the biggest surprise I ever had,” he said. “I just wish Paul had been here to see it.”17 Paul Waner had passed away in 1965. In 2006, Paul and Lloyd Waner were honored with sculptures outside Bricktown Ballpark in downtown Oklahoma City. They joined other baseball greats from the Sooner state, including Pepper Martin, Carl Hubbell, Mickey Mantle, Johnny Bench, and Warren Spahn, commemorating the state’s historic contributions to the game of baseball. 2 Clifton Blue Parker, Big and Little Poison: Paul and Lloyd Waner, Baseball Brothers, (Jefferson, NC: McFarland Publishing, 2003), 52. 6 F.C. Lane, “The Flashiest Youngster on the Diamond,” Baseball Magazine, June, 1929: 300. 8 Untitled/undated clipping, Ed Rumill, Christian Science Monitor, Lloyd Waner clip file, Baseball Hall of Fame. 9 Donald Honig, The October Heroes, (Lincoln, NE: University of Nebraska Press, 1979), 120. 10 Les Biederman, The Sporting News, “Brothers Tried hand at Vaudeville”, February 18, 1967: 15. 11 Donald Honig, Baseball America, (New York, NY: Galahad Books, 1993), 196. 12 Lane, “Flashiest Youngster,” 300. 14 Parker, Big and Little Poison, 231. 15 Pittsburgh Pirates website, accessed August 26, 2016. 18 Honig, Baseball America, 197.